If I’ve been able to help you think about WHERE to buy an HMO, you may want to know more about this in detail. 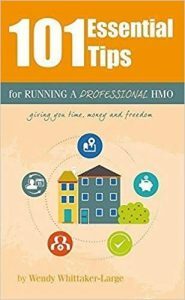 You can order my book ‘101 Essential Tips for Running a Professional HMO – Giving you Time, Money and Freedom’ here. (All you need to do is pay the P&P). 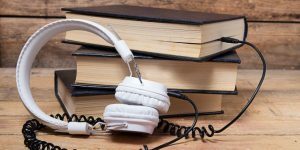 I started listening to Audiobooks about 3 years ago and at the time I was a little dubious about whether I would benefit from listening as much as reading a book. Being a visual person, I can get completely engrossed in a page of text, in a way that I thought wouldn’t be possible with an audio version. How wrong I was! I now find that whenever I’m in the car, cooking in the kitchen, or doing odd jobs around the house, I LOVE listening to audio books. There’s something very satisfying about completing a real, whole, complete BOOK (which believe me is a real achievement with four children) in the course of a mon th, over and above any ones I’ve also read. As well as being a fan of audio books, I am also a fan of Audible – the Kindle app that allows you to buy a monthly subscription and then take your pick of thousands of titles. You simply download and enjoy! There are so many topics to choose from – from investing, to property to HMOs (yes mine is also on there surprise, surprise) to cookery to yoga. Do you struggle to utilise your time? Do you need help with using your online calendar with your phone? Here Wendy gives some practical tips to mapping your time effectively. What system do you use to plan your time? Share in the comments! 52-week video series – Week 3 Planning – Fail to plan, plan to fail! Do you struggle to know where to focus your time? How to create balance in your life? How to prioritise your goals? 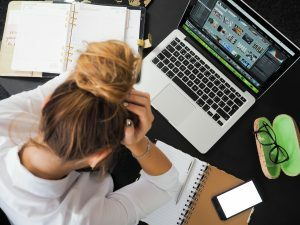 Too busy to systemise your business? Or maybe you are scared of the cost of it? It was a cold, rainy day – the kind of rain that drips over your nose and down your clothes and makes you sopping wet even before you’ve stepped outside. You know the kind I mean. A fairly typical summer’s day in England! I was sitting in our home office, when Andy walked in, cup of coffee in hand. As he sat down, I glanced across at his desk. The contrast between his desk and mine was stark. Mine – covered in all sorts of paper documents – bills, mortgage statements, letters, post-it notes of to-dos that hadn’t been done and should have been done last Friday. His – a monitor, wireless keyboard, mouse and speakers. No paper, no mess, no distraction. He sat down and put his wireless headphones on, and I started to hear the muted ‘thud, thud’ of The Gorillaz latest album. I muttered under my breath ‘GEEK’ .. and proceeded to wade through the paper on my desk, deciding the quickest way to deal with the pile was to push it all onto the floor and use it as a new form of carpet tiles. At least that way I didn’t have to look at it. And my desk was then as clear as my darling nerdy husband’s. ‘Do you have the mortgage offer for Gainsborough Road somewhere?’’ Andy asked as he moved one earpiece to hear my response. ‘Um, yes, er, definitely, I saw it this morning’ I said, knowing that it was definitely here, somewhere. The only thing was which foot was it under? After a search of about 10 minutes I enthusiastically pulled it out from underneath the pile and placed it ceremonially on top of his keyboard. ‘Wendy we need to talk’, Andy turned to me with a serious look on his face. ‘Oh, is the offer not what you hoped for?’ I replied. ‘No, it’s not that’ he said. ‘So what’s bothering you babe?’ I prodded. ‘Well, you know I love you very much Wendy, but there is one thing that is starting to drive me crazy’ he said. He took a deep breath, and looked me straight in the eyes, ‘the truth is, unless we sort out our systems, this office and all this paper we simply will not be able to scale up. Your desk is a tip, you can never find where anything is and you are wasting not only your own time but mine too’. I sat in my chair, feeling totally deflated. I had worked so hard to create a portfolio of HMOs that had given us financial freedom. We now had a regular passive income of £6k per month. The last three years had been nothing but hard work and I had the evidence to show that taking massive action, managing risks that many other people wouldn’t have the courage to do, and using other people’s money could create financial freedom. I had left my job and wound down my other business to focus on this one. Andy had also been able to leave his well-paid role as a contractor. We were supposed to be happy. But right now, at this point in time, the last thing I was was happy. I felt annoyed at myself, annoyed at him, and annoyed with the business. The thing is I realised that Andy was right. Deep down, I absolutely KNEW that my entrepreneurial skills were great when it came to new ideas, growth, and creating income. 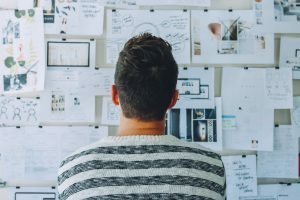 But on the other hand, creating a system that someone else could pick up and use and freeing up my side of the office from all that paper that I had grown to know and love – well that was NOT within my gift. I knew I had to change, I knew the business had to change and I knew that the only answer was to systemise. So over the next 12 weeks, Andy and I set about looking at ways that we could create a leaner, more automated, systematic and ultimately leveraged business. We wanted to employ staff, or outsource the things we didn’t like doing. But to do this we had to start moving our erratic business practices onto a much better platform. Immediately we began to notice a difference. First in the time we had. We had much more of it! The little jobs, the things that I would have had to write on a post-it note and stick on the edge of my monitor just to remember them, were gone. They were contained within a system. As long as I remembered to go to the appropriate tool, I could find exactly what I wanted when I wanted it. Soon, this impacted our profits. We had more time so we had more time to do better deals, and more deals, and find more investment. In fact in that year alone we raised over £500,000 for further HMO projects. We bought another 9 properties, and added another £3,700 to our monthly income. There was no way we could have done that if we had been stuck behind our screens or on our phones managing refurbs, tenants or payments. Our quality of life started to improve as we had more time to exercise, to do more with our family and to R-E-L-A-X. This was all because we had systems. Then the best part began as we realised that with the systems we had implemented, we could create a team to manage our properties, with marginal involvement from us. So we began to recruit – first a Lettings Manager who would run the lettings side of the business, then an Operations Manager who would run the day to day aspects of the business. This then, in turn, freed up mine and Andy’s time to do other deals and to speak with investors and to pursue some of our other passions. So HOW EXACTLY did we do this? What were the tools that we needed and how would we decide? We realised that the process would be a three-step process. First we had to SCOPE the business and decide how to breakdown each area, then we had to SPECIFY what our business did in each of these areas, then we had to SYSTEMISE. Most of all it had to be LOW-COST or NO-COST so that we could free up our time without taking up all of our profits. Although I can happily use a computer and mobile phone, I am not the most technical person in the world so our system had to be easy to learn and implement. The last thing I wanted was anything that needed multiple log-ins or a computer science degree to operate. And that tool is…. ? If you’d like to know EXACTLY what that tool was and HOW we used it to run and grow our business (and still do to this day) and how YOU can too …. How are you going to make the remaining weeks of 2017 count? Where did 2017 go? Do you realise there aren’t many weeks left? Have you got goals that you haven’t reached? Ideas that didn’t formulate into a plan? Strategies that never took off? Now is your time to SPRINT into 2018 by making this last sixth of 2017 really count – if you haven’t got a PLAN – write one. If you haven’t found a STRATEGY – decide to go for it anyway. If you haven’t clarified your GOALS – do it NOW. Do you want to raise £100k for 2 HMOs? Do you want to find 6 cash-flowing deals that you can source and sell on? Do you want to lose 6lbs in weight? Do you want to increase your income by £2k per month? Don’t start by thinking these things are impossible. Start by writing your goals and making a plan. Then you need to activate those things on your plan by assigning times to them, deadlines and how you will stay accountable. Take 30 minutes TODAY (even if it has to be at 10pm tonight) and sort out the last few weeks of this year to be BIG. Yes it will require you to give up lots of things – TV, socialising, shopping, drifting, wasting time! Instead, you will need discipline, focus, commitment, determination. You will need to take MASSIVE action. But not only will it pay off this year, you will SPRINT into 2018 ready to go for it! So what are you going to do? What are you waiting for? A great idea that I found online: Deep-clean your social media. Over the remaining weeks, focus on upgrading the quality—not always the quantity—of your online communities. Strive to fill your screens only with content that inspires and motivates you to become a better version of yourself. Follow people and companies who post positive, encouraging messages, and unfollow any individuals or groups that aren’t conducive to your goals. Over the two-month period, you should start to notice a more constructive and motivating online environment. Do it, Delegate it or Ditch it! Boring, dull, monotonous – these are often how we think of the small aspects of our lives and business aren’t they? Many of these small things are SO important though, as like breathing, drinking water, and sleeping they create a rhythm which keeps our businesses healthy and infection-free. and replying to emails and managing paperwork. I’m talking about maintenance and spreadsheets and tradesmen. I’m NOT talking about MONEY IN YOUR POCKET. I’m NOT talking about PASSIVE INCOME. “BUT “– ( I can hear you say) “WHAT IF I ABSOLUTELY LOATHE DOING THOSE THINGS WENDY”? In other words, you know they NEED to be done, so that you can MANAGE, SCALE and GROW. But you cannot face doing them? Or Delegated. THIS IS THE ANSWER. If not you will end up DEFERRING your results, DELAYING your financial freedom and DESTROYING your hope. NONE of which I want for you. “BUT WENDY” ( I can hear you say)” I CAN’T AFFORD TO EMPLOY SOMEONE TO DO THE THINGS I HATE” . Ok well find some other way to reward those who help you. You are an entrepreneur – draw on your creative skills and utilise those around you (and in this group) effectively! Solve someone else’s pain and in doing so, you will find your pain is solved.